Nobody enjoys looking after an unhappy baby. Whether your child is tired, irritable or fussy, there’s only so long even the most patient parent can withstand swinging and rocking a crying baby. It can become incredibly overwhelming, especially if you have a busy day ahead of you. Fortunately, there’s a simple solution that can bring a smile to both you and your baby’s faces. Recently there has been an influx in baby swings, a fantastic design that can professionally and naturally mimic the motion of a swaying mother, calming your baby, so they can relax and fall asleep. However, there are a ton of baby swings to choose from, each with their own set of features and prices. To give you a helping hand, I’ve handpicked my favorite baby swings, allowing you to see the various features, so you to make the best decision for your baby. 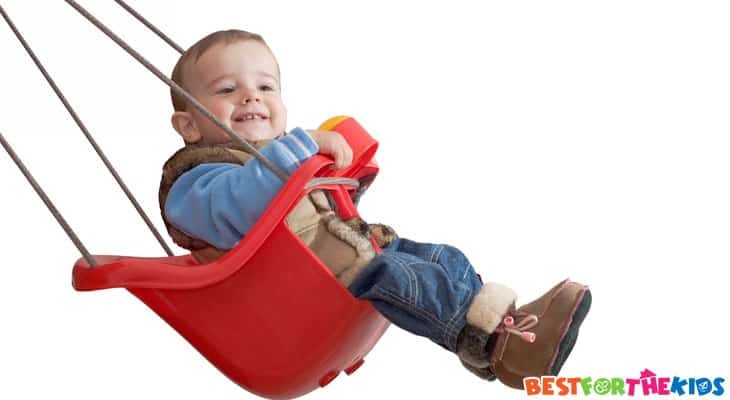 If you're not sure what you’re looking for when it comes to baby swings, my step-by-step buying guide details all the information you need to purchase the perfect baby swing. Get ready to discover a new world of calm and productivity in your day-to-day life. These are my handpicked baby swings that can change your life. To start my list, I’ve chosen a fantastic all-round baby swing that is high-quality and durable without an expensive price tag. Professionally made using a range of plastics including PP, ABS, and POM, expertly combined with steel and polyester, you’re left with a durable, sturdy frame to support your baby. The swing itself sits between two sturdy support frames that hold a comfortable swing that supports your baby’s body as it grows. Inside the seat, the cushion materials are easily removable, giving you the ability to machine wash them, allowing you to maintain the highest levels of hygiene. The seat itself houses a 3-point harness safety system that ensures your child is safe and secure while enjoying the benefits of a two-position reclining system. The removable toy bar allows your child to remain entertained at all times, and includes two fun and colorful plush toys for your baby to play with. When it comes to the swing itself, you can manually switch between the 6 various speed and swing settings, so you can find the perfect speed for your baby to fall asleep. What's Great About It: This baby swing is ideal for parents who want their children to enjoy the most peaceful sleep possible. In addition to the 6-speed swing settings, you can choose between 6 unique melodies that create a calming and relaxing atmosphere. The control panel boasts a full volume control option and auto-shutoff functions, ensuring your baby remains undisturbed. 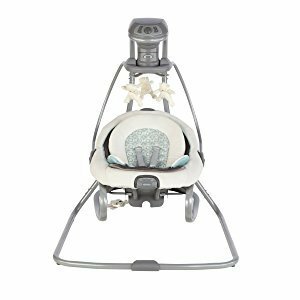 If you're looking for an extremely comfortable baby swing that’s packed full of features, the mamaRoo baby swing could be ideal. 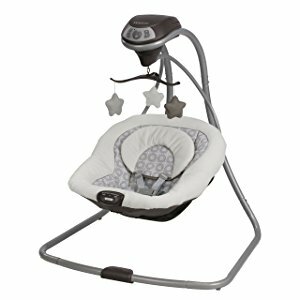 With five unique and specially designed speeds to choose from, this baby swing gives you full control over how your baby will fall asleep. Each swing setting has been designed to naturally mimic a parent’s rocking arms, making sure your baby is comfortable and at peace whilst in the swing. The swing itself is supported by a sturdy base that allows you to set up and use the swing in any room of the house. The seat is fully adjustable to any reclining position you see fit, and the 3-point harness system ensures your baby is safe and secure at all times. The internal cushion is made from extremely comfortable 100% polyester fabrics, maximizing comfort for your baby, and is removable and safe for machine washing. Furthermore, this swing prides itself on its overhead toy bar, complete with three colorful plush toys that keep your child entertained when they are awake. What's Great About It: The control panel at the base of the swing provides you with a full range of controls that let you choose the swing settings, music, and vibration settings, giving you a fully customizable experience. The seat is also Bluetooth enabled, so you can control the swing using the dedicated smartphone app from anywhere in your home. 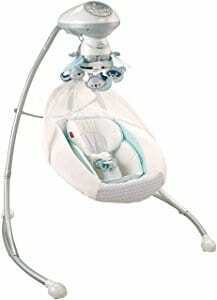 This stylish and functional baby swing is packed full of features that you and your baby will love. The ConvertMe Swing prides itself on a 2-in-1 design, allowing you to effortlessly convert the swing into a fully functional baby bouncer. The compact design means you can easily fold the swing away, allowing for space-efficient storage and easy transportation. This swing itself utilizes patented Hybridrive Technology, allowing you to enjoy hour after hour of operation on a single charge. The seating area boasts a high-quality 3-point harness system, and the overhead toy bar includes a cuddly plush toy, and you can also add your own. The internal cushions of the swing are made using comfortable high-quality fabrics that are easily removable and suitable for machine washing, enabling you to maintain a clean and hygienic swing. What's Great About It: This swing features the patented WhisperQuiet motor technology, which means your baby can sleep peacefully while swinging, undisturbed by motor noises from the swing. This motor can be set to three different time settings, automatically switching itself off for a calm and restful sleep. 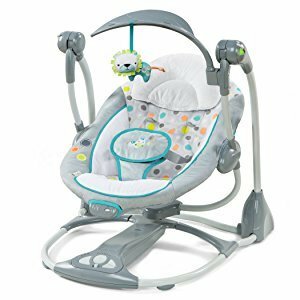 If you are looking for an affordable baby swing that doesn’t compromise on comfort or quality, the Graco Glider is an ideal solution for restless babies. The swing is securely fastened to a durable external frame, so the swing can naturally produce a parent-like motion that will gently rock your baby to sleep. The internal seat provides a supportive and comfortable nest for your baby to sleep in, while the overhead toy bar provides endless entertainment when your child is awake. The unique frame is purpose-built to be around 40% smaller than most swings, making it ideal for any room in the house. This level of portability is maximized by the ability to power the swing from a mains out or on the included batteries. There are two vibration speeds to choose from in addition to the six customizable swing speeds, allowing you to find the perfect setting that will put your baby into a deep sleep. There are three reclining positions as well as a collection of lullabies, melodies and sounds to choose from. What's Great About It: One of the best features of this swing is the great comfort levels that it provides. The seat is produced using high-quality materials that support your baby’s body as they grow, promoting healthy bone and muscle development. If you’re looking for a super comfortable baby swing, one of the leading brands, Fisher-Price, has a solution for you. Boasting a rich, comfortable, soft fabric, your baby can enjoy maximum levels of comfort whether they’re resting, playing or sleeping. This nurturing seat is securely fastened to the swing, which prides itself on six different speed settings and three customizable seating positions, ensuring your baby is always as comfortable as possible. Overhead the swing, you’ll find a fun toy bar with plush toys, which will keep your child entertained for hours. 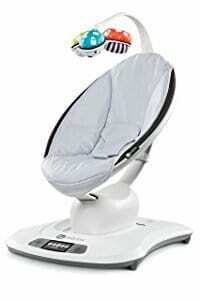 There’s also a canopy to stop potentially harmful UV sun rays from reaching your baby’s skin. The swing can be operated using batteries or powered through a mains outlet, allowing you to use the swing in any room in the house. 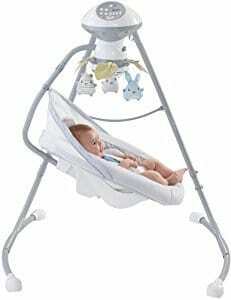 What's Great About It: The swing contains specially designed music to help induce a deep sleep for your baby. There are ten musical tunes to choose from, as well as three high-quality nature sounds, making sure your child will enjoy a calm and peaceful environment wherever they go. This swing is an upgraded model of the other Fisher-Price swing on my list, and it gives you access to a full range of features your family will love. The simple design allows for two methods of swinging, either side to side or back to front. The durable frame prides itself on an easily adjustable system, so you can effortlessly change the positions of the swing with the click of a button. With regard to the swing itself, there is a specially designed body insert cushion and accompanying head support, which are removable and suitable for machine washing. You can also choose to set the swing between two reclining positions, maximizing the levels of comfort. The swing itself can be powered by a mains outlet or on the included batteries, so you can take this swing with you wherever you go. There are six swinging speeds to choose from, and the sixteen high-quality audio tracks and natural sounds help promote a calm and relaxing environment. 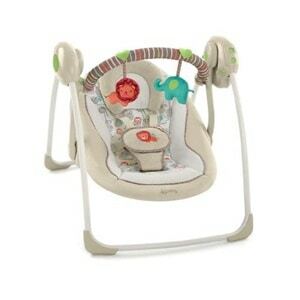 What's Great About It: Similar the previous Fisher-Price model, comfort is maximized in this swing. Using patented SmartSwing technology, this swing automatically detects the weight of your baby, which helps you choose the perfect sleeping speed. 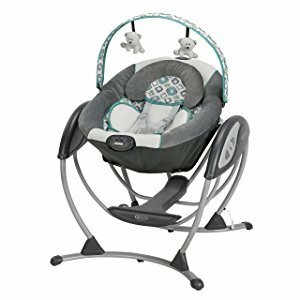 If you’re looking for a multi-functional baby swing that’s overflowing with quality and features, the Graco Duetsoothe makes for an excellent solution. The 2-in-1 design means you can effortlessly adjust the swing into a fully-functional rocker, saving you time and money. In the swing position, you can choose from three different positions, allowing your baby to comfortably swing from side to side or back to front, so you can find what works best for your little one. In the rocker position, your baby is fully supported in a way that promotes healthy growth for your baby’s body. There’s a specially placed handle that helps you safely and easily take your baby with you wherever you go, and can be powered by mains electricity or through the batteries. The swing creates a natural swaying sensation while the built-in sound effects and music help to promote a deep and refreshing sleep. What's Great About It: In addition to the ability to switch from a swing to a rocker, the seat of this device features fully cushioned body support with multiple reclining options, enabling you to find the perfect position where your child is most comfortable. To conclude my list, I’ve selected a classic baby swing that provides optimal support and comfort while maximizing functionality for an affordable price. Priding itself on its small design, this baby swing takes up minimal space, making it suitable for any room in the house. It is light enough to be taken with you as you go about your day-to-day tasks. The swing is capable of traveling in a side to side motion, gently swaying your baby to sleep in a soothing and relaxing way. There are two vibration settings to choose from in addition to the six customizable speeds, allowing you to select the perfect rhythm and pace to suit your child’s preference. Boasting a five-point harness system, you can be safe in the knowledge that your child is safe and secure at all times. Powered by mains or by batteries, you can also choose from a selection of 10 high-quality tracks or five relaxing nature sounds, creating the ideal atmosphere for your child to fall asleep. What's Great About It: This swing really does cover all the bases. In addition to the features above, your child can enjoy the included overhead toy bar, featuring a collection of soft, vibrant plush toys which will keep your child entertained. The soft, cushioned interior of the seat also provides optimal levels of support and comfort. Whether you’re shopping online or at a local store, there are so many features to consider when it comes to baby swings that it can be difficult to know where to start. Use my step-by-step guide below to ensure you’re making the best purchasing decision possible. As a baby swing, the swinging functions are one of the most important aspects to consider. The majority of baby swings come with a minimum of three-speed settings which is usually enough to cater for an active or sleepy baby. However, it’s highly recommended that you choose a swing with six swinging speeds as that will allow you to customize the swing to your baby's liking. If you choose a traditional manual baby swing, there will be no speed settings to choose from. You will also want to consider the direction in which the swing travels. In most cases, swings movie side to side and backward and forwards. Some babies prefer different settings and it solely depends on your preference. Saving you time and money, it’s advised that you choose a swing that can cater to both. With electronic baby swings, it’s important that you consider the timer functions of the swing. This is a feature that will count down from a pre-set time and will shut off the swing when it reaches zero. The average maximum time is around 45 minutes. Monitor how long it takes your baby to fall asleep and then set a time near to this mark. This will ensure that your baby remains undisturbed. The frame of the swing is extremely important. As with most products, the cheaper the product, the cheaper the materials, which will result in a less durable frame that could break easily. The most advised kind of frame will have a wide base, as to avoid tipping over, but ensure that the legs of the swing don’t stick out too far; you don’t want to trip on the swing in the middle of the night. Your baby's neck and back are the most sensitive parts of their body. When using a baby swing, you want to make sure that this area is fully supported at all times, no matter what your baby is doing. To fully support these areas, you’ll want a baby swing that has multiple recline positions that you can easily set. This will give you the ability to set the swing to a vertical or horizontal position, maximizing comfort and support. 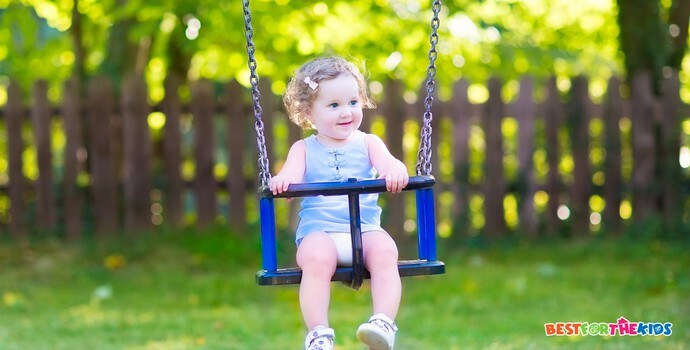 One of the main objectives of a baby swing is keeping your baby happy. If you’re busy completing your day-to-day tasks, but still want your baby to have a smile on their faces, the entertainment factor is very important. Many swings will come with overhead toy bar specially designed to hold plush toys, or your own toys, attracting your child's attention while giving them something to engage with. Due to the swinging nature of a baby swing, many come with music abilities and their own built-in tracks to keep your child happy as they swing. With these music features, you’ll want to ensure the swing has a volume control and that the songs are high-quality. On more premium swings, you can even enjoy features such as Bluetooth, enabling you to effectively control the music from your smartphone device. An uncomfortable baby is an unhappy baby. Always ensure when picking out the perfect baby swing that you choose one that provides a thick amount of padding. The thicker the padding, the more comfortable the swing will be for your baby. However, you don’t want it to be so thick that your baby simply sits on top of it. Look for a nice balance where your baby will be cushioned and supported. As with any baby related product, a harness system is vital for the safety of your baby. The majority of swings will come with a standard three-point harness system that will hold your baby in place. For increasingly active children, you may want to look towards a five-point system that will add an extra layer of safety for your baby. Baby swings have single-handedly changed the way that parents can care for their children. We all live busy lives and there are always jobs that need to be done. By investing in the right baby swing, you can always ensure those jobs are completed while effectively looking after a happy baby, reducing stress and increasing the number of smiles you see every day.